This website is a non-profit, non-political and non-partisan service for the benefit of all. 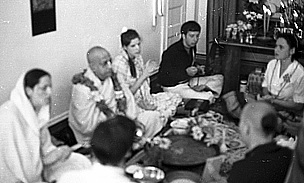 Selections, quotes and photographs from Srila Prabhupada's books and lectures are reprinted from the Bhaktivedanta Book Trust, Back to Godhead, Vanipedia and Prabhupada Vani. Special thanks to the Bhaktivedanta Archives for providing many of the images used in these pages. Some memories are reprinted from ISKCON Cinema, ITV and Prabhupada Memories. We also have a Guestbook for your messages. Thank you for your interest in The Prabhupada Connection.